Thanks to an astute LaceNews reader, I’m changing all those ‘Nov’ auction end dates to ‘Apr’. Oops. Maybe I was just thinking it actually is November, because it’s snowing outside right now. And I added 4 more pieces on Sunday. Comments: A dress front of silk Maltese or Gozo. Excellent guipure work against a background of small woven leaf flowers – this kind of guipure work is unusual in a piece like this. 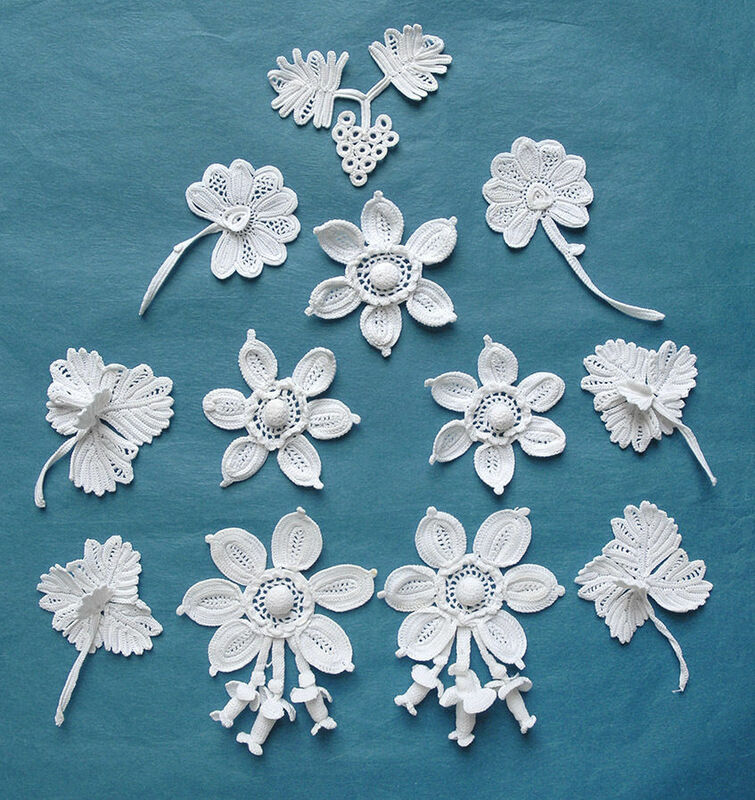 The flowers also form the border of the piece. Note the delicate plaiting on the neckline. Nice presence to this piece. Damage: One separation lower left in photo – looks like a loose seam, minor. Soilage: Seller cites some faint storage marks. Unsold as of 4/26/2015 2:45 PM MDT. Comments: A deep collar of needlerun embroidery on black machine net. Some of this is done in gold colored thread, although it’s not too obvious from the photos. 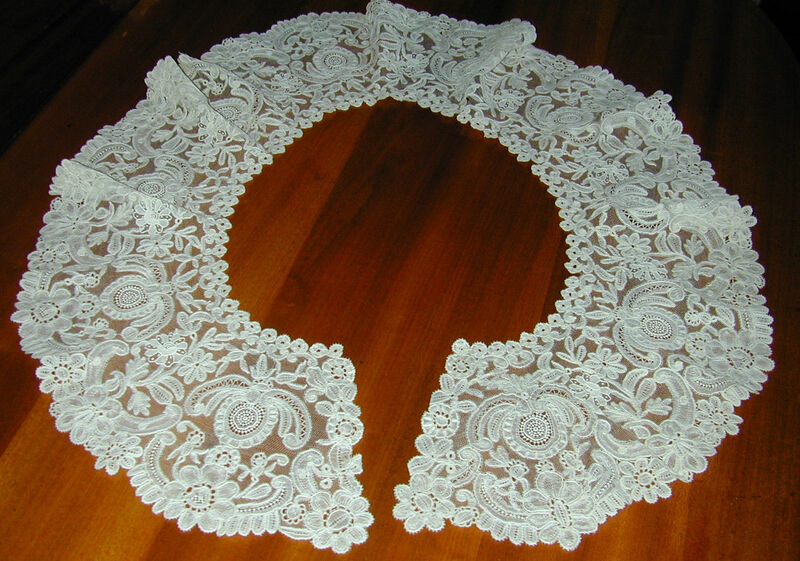 The white embroidered flowers seem to imitate Belgian Point de Gaze roses, even to the small rings in an arc above the center points. A fairly dramatic design against the black tulle. 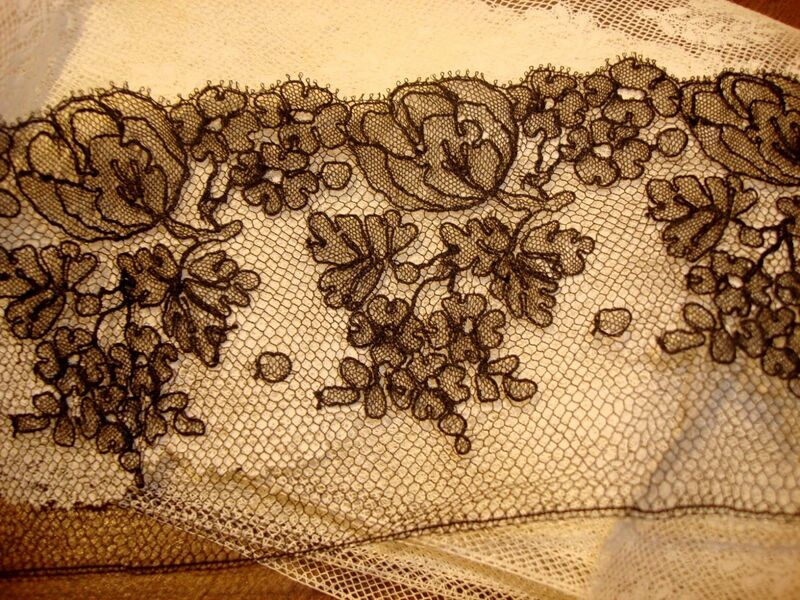 Embroidery on black net is not common – but we have two pieces this week. Damage: Some pinholes in the mesh, a little wear to the neckline with small holes. Soilage: Nothing obvious from the photos. Finish: No obvious creases or wrinkles – might be something down center back, but it’s faint. 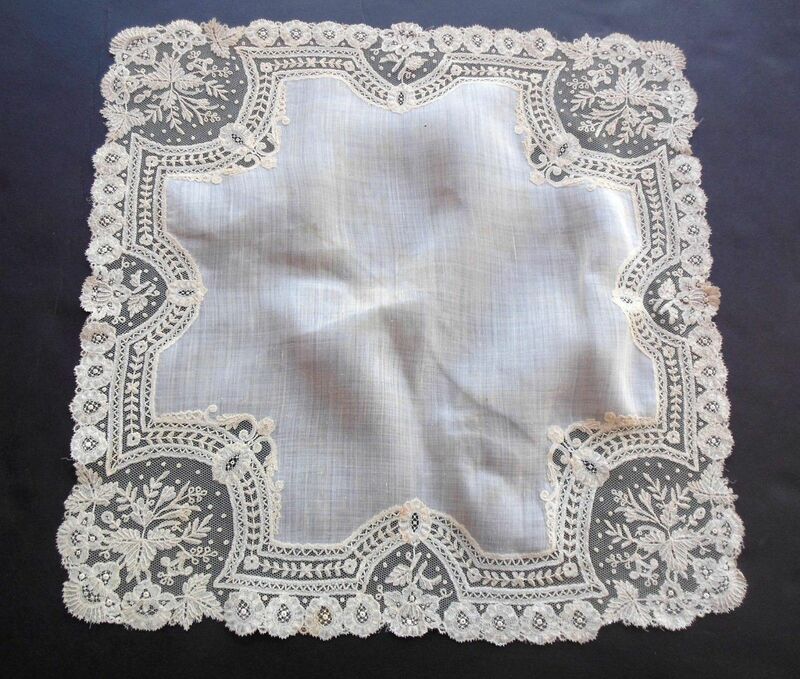 Comments: A handkerchief edged with Flanders lace. I think the 5-hole ground may have been made with twists, compared to a later version with no twists. There is also no gimp in the design, which also might date it a little earlier than what we think of as late 19th c Flanders. Note also the more complex snowflake fillings. Technically this is an interesting piece, but still later 19th c. Note the whitework double B monogram, and linen center cloth. Soilage: Seller cites a label stain. Finish: Horizontal and vertical fold creases, also wrinkled. Comments: A table runner edged with Rosaline perlé. The perls look needlemade. Good overall design, I especially like the chain of small buds with perls. Soilage: Seller says the piece has been washed, and gives some details. Slight discoloration remains especially on fold lines. 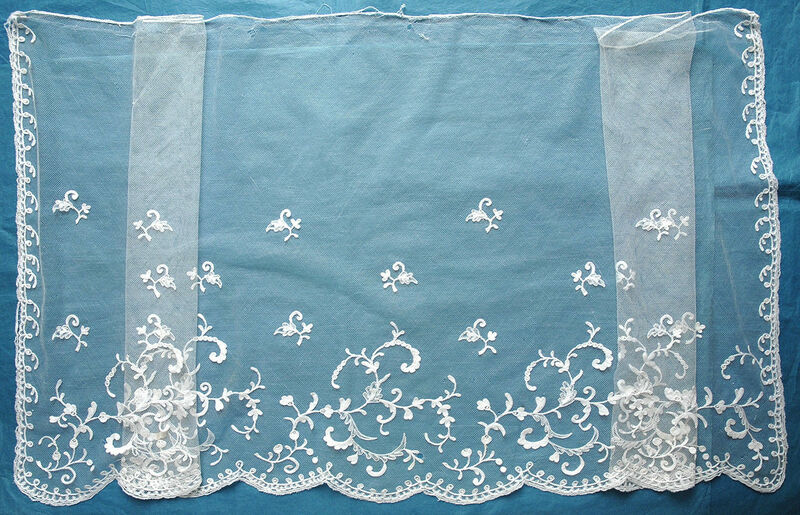 Finish: Vertical fold lines, and the center cloth is a little pulled along the seams with the lace. Sold for $235.00, 1 bidder. Comments: This fallcap looks like it might be made of linen, which is not a typical Beds material. The raised work and tallies looks a little more like Cluny, or perhaps a German guipure. Note the little sun-like motifs which you find in Maltese. I’ll stick it in my general ‘unknown guipure’ category until something better comes along. Damage: ~1″ of edge detached near the join with the headpiece. Some wear in places along the outer border. Finish: Might be some fold creases in the lappets. Sold for 13.00 GBP, 3 bidders. 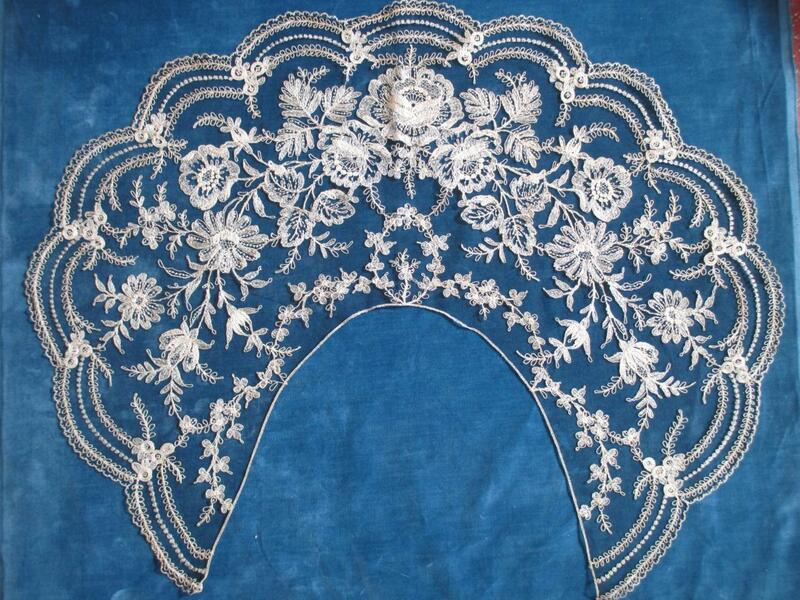 Comments: The design of this piece is almost the same as plate 233 of Ricci’s Old Italian Lace. It is labeled ‘MILAN- XVI-XVII CENTURIES’ (English edition, I show part of the Ricci plate below. The treatment of the brides is slightly different, and there are fillings in the Ricci flowers not present in the Ebay piece. The design is symmetric along the horizontal center, and the lower border of the Ricci photo looks more like the upper border of the Ebay piece. With that in mind, the lower edge of the posted piece should correspond to the upper edge of the Ricci, and does look cut off. Although the added plaited edge looks contemporary. I have a piece like this in my own collection. Modifications: Borders added, lower edge might be cut. Ends cut. Sold for 97.99 GBP, 2 bidders. Comments: A narrow border of 19th c Mechlin, could have been made anytime in the century. One floral spray along the border, one bud in the ground above. Damage: A few localized tiny holes. Soilage: Looks a little beige in color. Finish: Some vertical fold creases. Sold for 6.00 GBP, 2 bidders. Size: each 2-3/8″ long including stem. Comments: The seller thinks there might be a wire in the stem of these leaves, which might mean they were meant to be used in some kind of floral spray. The wire seems to run up along the center of the leaf. Otherwise they are pretty standard Point de Gaze motifs. Individual Point de Gaze elements are rare. Soilage: Looks a little beige in color with a few tiny rust spots. Sold for 20.50 GBP, 4 bidders. Comments: An early 18th c Flemish flounce with typical 6-sided plaited ground (similar grounds are found in contemporary Milanese). 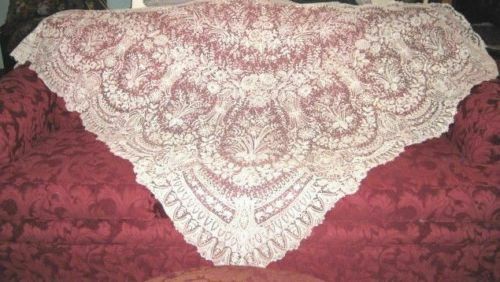 This is a pieced lace with the ground worked around the motifs. Good swirling light design. Modifications: Ends cut with additional border added later. 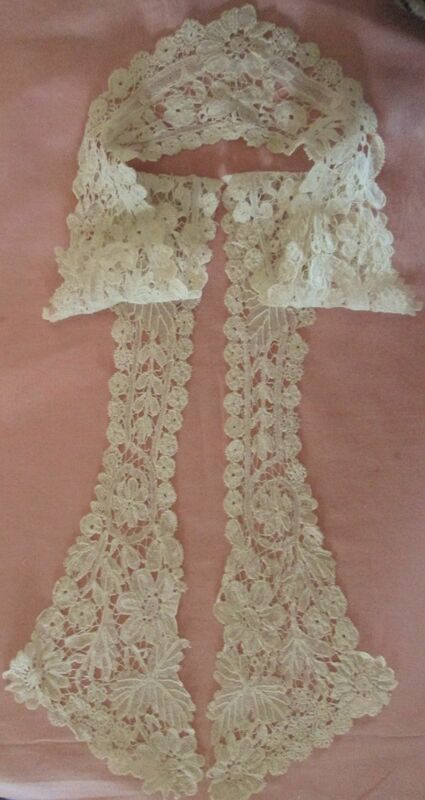 One edge attached to a tape, but the lace sewn to it looks original. The other edge might be original, but looks fairly worn. Damage: Seller counts a dozen small holes in the ground, one 1″ long. Soilage: Aged beige color, which is fine. This might be a trick of the light, hard to tell the exact color. Sold for 161.00 GBP, 3 bidders. Comments: An border of Blonde de Caen, looks unused. Large leaves along the border, with a double row of esprits. Excellent technique. Damage: Occasional pinhole – looks unused. 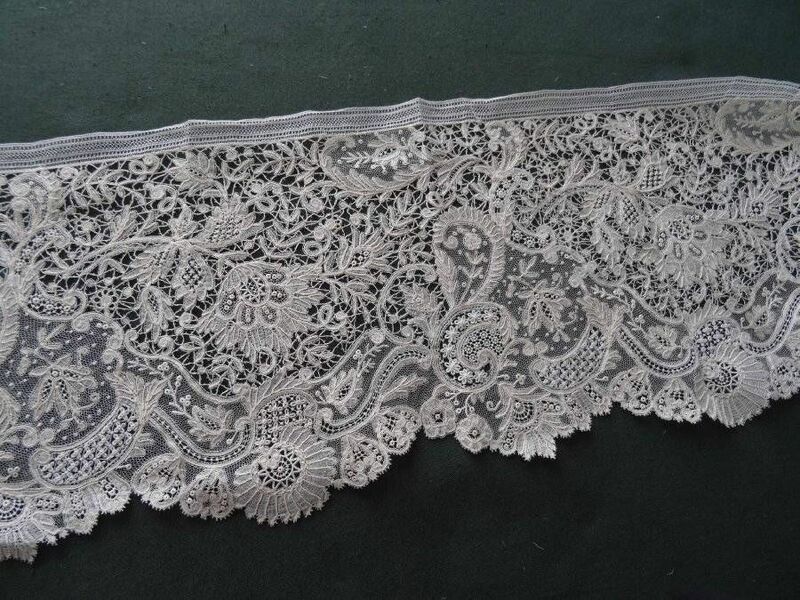 Soilage: Slightly grey ivory color, seller says this is the typical color for this lace. Finish: Minor creasing at one end. Sold for 215.50 GBP, 7 bidders. Comments: An Rosaline style collar with no perls. Alternating half and whole stitch shading in leaves and flowers. Otherwise a rather meandering design with twisted pairs thrown across and back used as brides. Simple looped borders as in Rosaline. It’s an interesting variant, but not as elaborate as more advanced designs. Soilage: Seller cites one area of age browning. Finish: No obvious creasing or wrinkles. Sold for 48.50 GBP, 2 bidders. 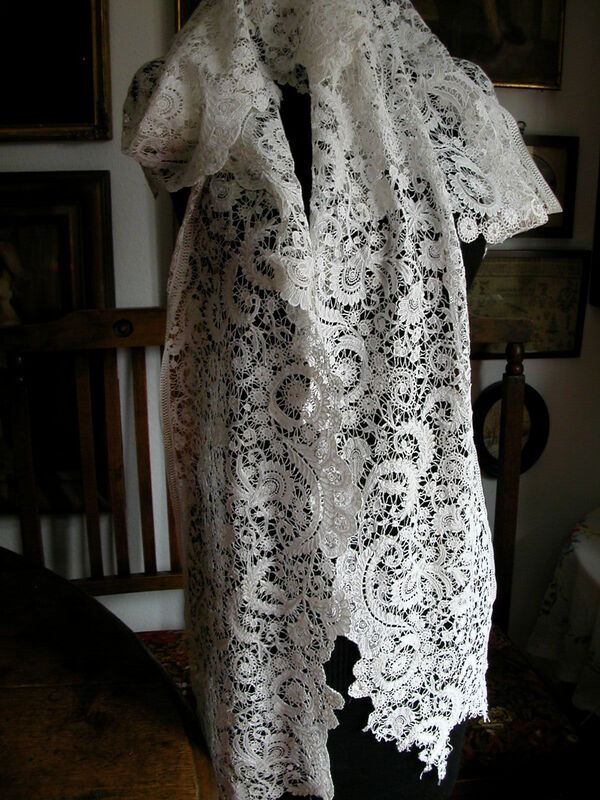 http://tinyurl.com/nqnuacz Antique/vintage black silk net and cream tambour lace scarf. Comments: A narrow scarf of tambour embroidery on black machine net. Includes 2 sections of a similar border. The embroidery looks like a cream color, quite effective against the black tulle (at least against the blue background). The border sections have a more elaborate design. Modifications: Borders cut on both ends, scarf intact. Damage: Header detachment on one border. Seller cites some small repairs. Finish: Might be some creases in the scarf. Sold for 19.00 GBP, 4 bidders. 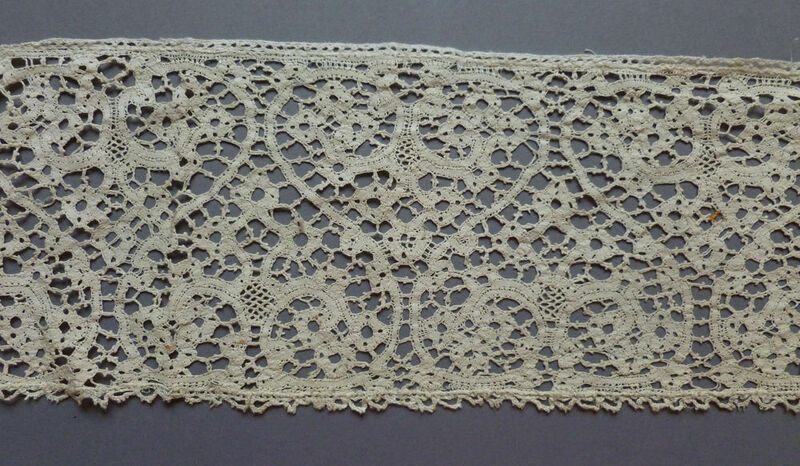 Comments: Twelve Irish Crochet motifs. From the presence of the padded raised work and the pendent 3-D buds, I think these are French. Some flowers also look like similar designs in Dillmont. Excellent technique, and quite unusual to find individual motifs. Finish: No obvious creases or wrinkles. Stems a little twisted, which can be expected from the crochet technique. Sold for 35.00 GBP, 4 bidders. Starting Price: 10.00 GBP on both. 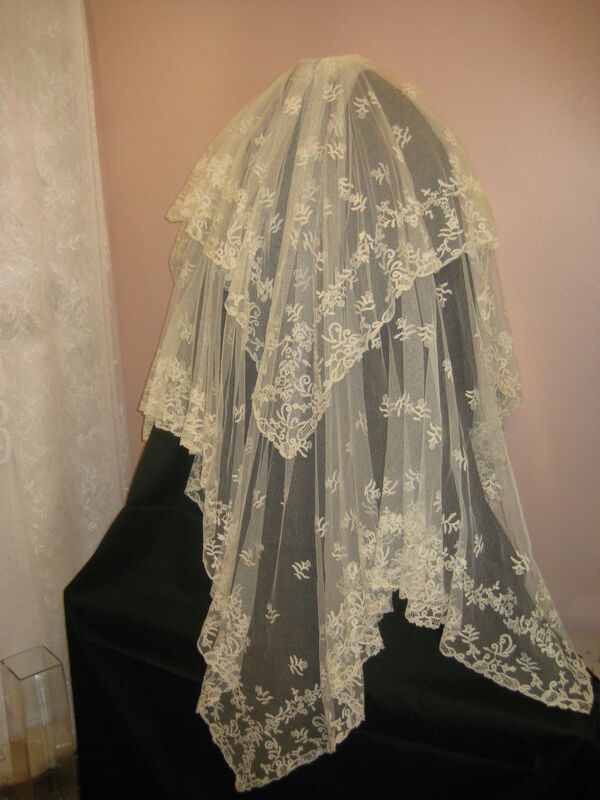 Comments: These two bonnet veils of tambour embroidered machine net are similar so I’ll review them together. First one has a light floral design with three rows of sprigs in the middle ground, none toward the top. Second one has a very simple narrow edge at the bottom, esprits throughout the ground, and slightly scalloped borders. Modifications: None. Note the cut edge at the top of the second piece, this is a little sloppy. Damage: A few small holes in the tulle on the first one, most near the top. Top border a little frayed. Second one looks OK, just a few loose threads on the borders. Soilage: 1st – Some pale brown age spots. 2nd – very pale ivory/old white color. Finish: No obvious creases, slight wrinkling on first. Second has vertical and horizontal fold creases. Sold for 10.00 GBP, 1 bidder. Size: 5″ x 11″ each. Comments: Honiton guipure, of the size and shapes to be cuffs. However the engrelure added onto each end throws a little doubt on that purposes. Rose and thistle design in a snails/slugs style. The design is very scattered. Plaited, picoted brides with some decoration where brides meet that I can’t make out too well from the photos. Modifications: Probably modified on the ends. Damage: One separation along lower border of one piece. Comments: A dress front and probably matching choker collar of embroidery on machine net. Needlerun stitches, both flat and in filling style. Some buttonholed rings scattered along the borders and in the free ground. Note the rather blocky appearance of the motifs. Edges are nicely finished with what might be buttonhole, photos not close enough to tell. Damage: Occasional pinhole in the mesh, minor loose threads on borders. Sold for 8.00 GBP, 1 bidder. 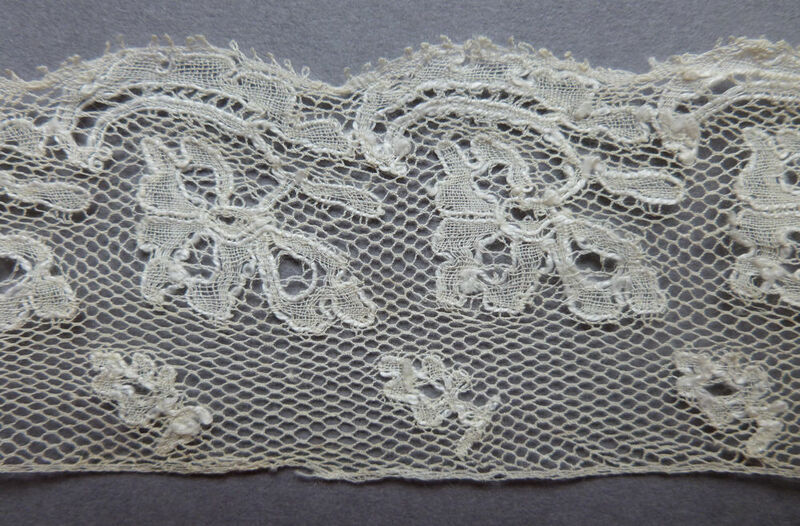 Comments: A tape lace border with plaited 6-side mesh, which was used in the late 17th, early 18th c. The presence of threads carried over on the back of the motifs is not necessarily a sign of Flemish lace, it was used both in Flanders and in narrow tape Italian Milanese. The carried-over threads also sometimes correspond to decorative fillings in the tape loops. Difficult to assign a place of manufacture, but the symmetry of the narrow tape design recalls more Northern Italian to me. And I’d put it later in the 18th c, maybe 19th. Plaited border looks contemporary, but it is an addition. Modifications: Cut one end, can’t see the other end. Lower border a separate addition. Damage: Occasional discontinuity in the mesh, but that’s probably deliberate. 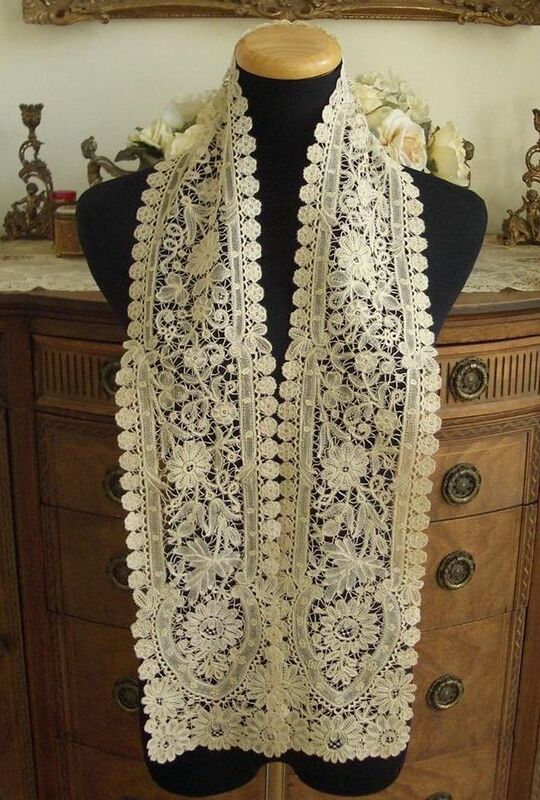 http://tinyurl.com/nhq3wzn Antique vintage lace shawl,veil stole Brussels bobbin lace applique 19th Century. 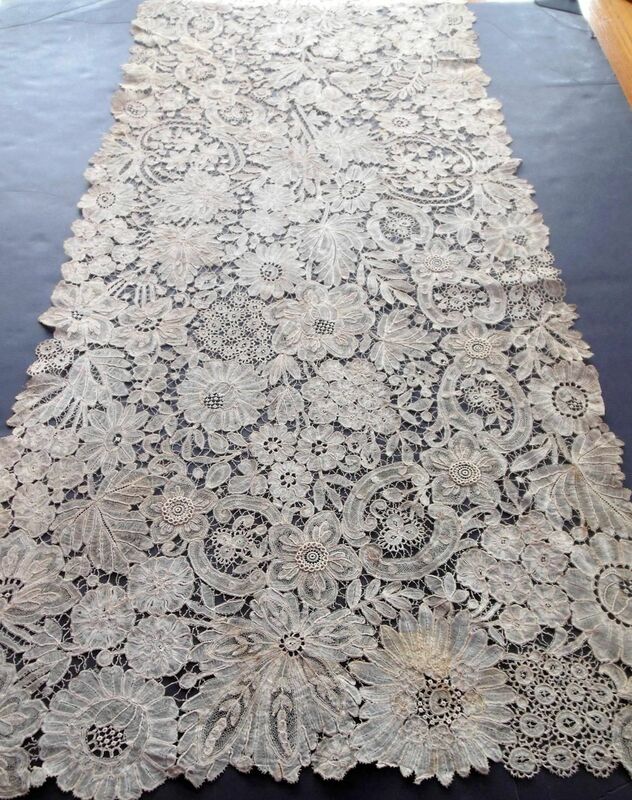 Comments: Mid 19th c triangular shawls of Brussels application on machine net are rare, I’ve counted 8 comparable to this piece on Ebay since I started the Alerts in 2010. Yet we have two this week! This is Brussels bobbinlace application, and I don’t see any obvious needlelace other than some small rings used as fillings. Not much in the way of raised work in the bobbinlace, just bundled thread veins. Good 2nd Empire romantic floral design with esprits scattered in the open spaces. Damage: Several holes and pinholes in the tulle, well documented in the photos. Soilage: Seller cites ivory color with faint stains and discoloration. Finish: Motifs have the shrunken look indicative of past washing. It’s not laying very true in the photos, probably could use some blocking. Sold for 620.00 GBP, 9 bidders. Comments: I’m thinking this is an Italian piece, not Belgian, maybe from the Abruzzi region. It’s a little heavy for Belgian work, nicely around the corners, but the join is a little clumsy. It just doesn’t look Belgian. Finish: No obvious creases, center cloth slightly wrinkled. Comments: A narrow border of Chantilly, simple pattern of roses with leaves above. Single esprit between motifs. Narrow borders of Chantilly are a little unusual. Damage: Nothing obvious from the photos, but there aren’t many photos. Finish: No obvious creases or wrinkles, few photos. 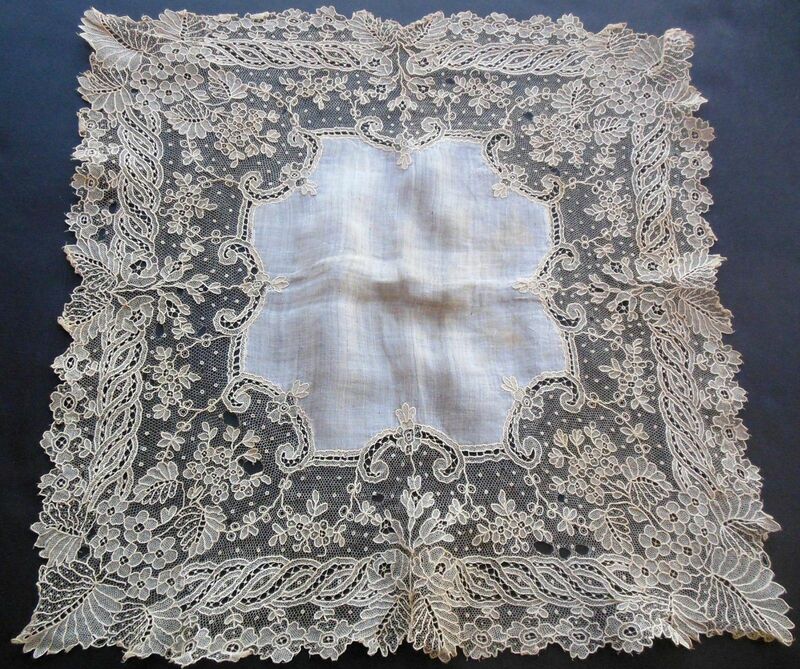 Comments: A handkerchief of Brussels bobbinlace application on machine net. 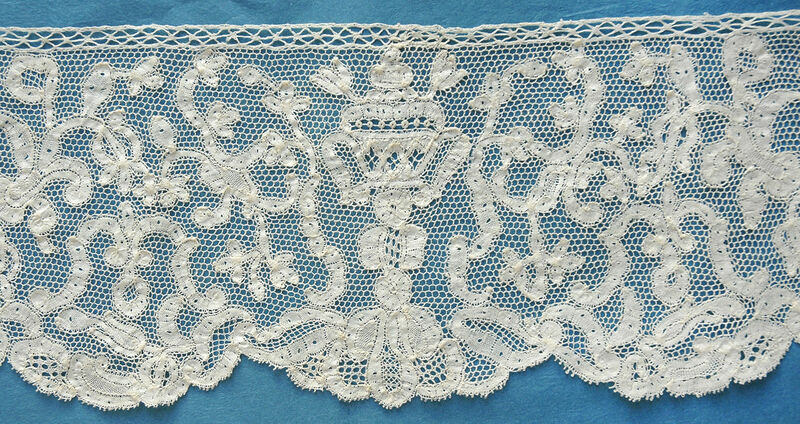 The term ‘point d’Angleterre’ in 19th century lace means bobbinlace motifs with a point de Gaze ground and needle-made fillings. 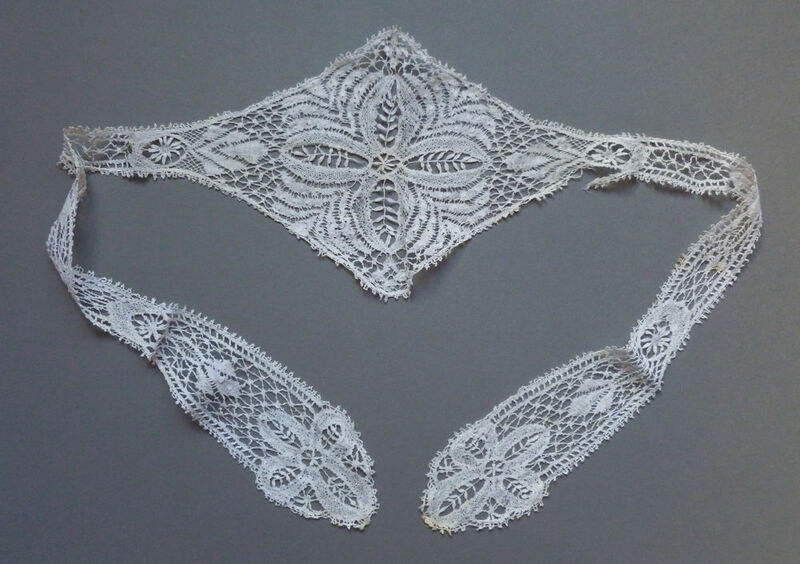 The term was also used in the 18th century, but has fallen out of use today because it is too vague to really identify the origin of the lace. 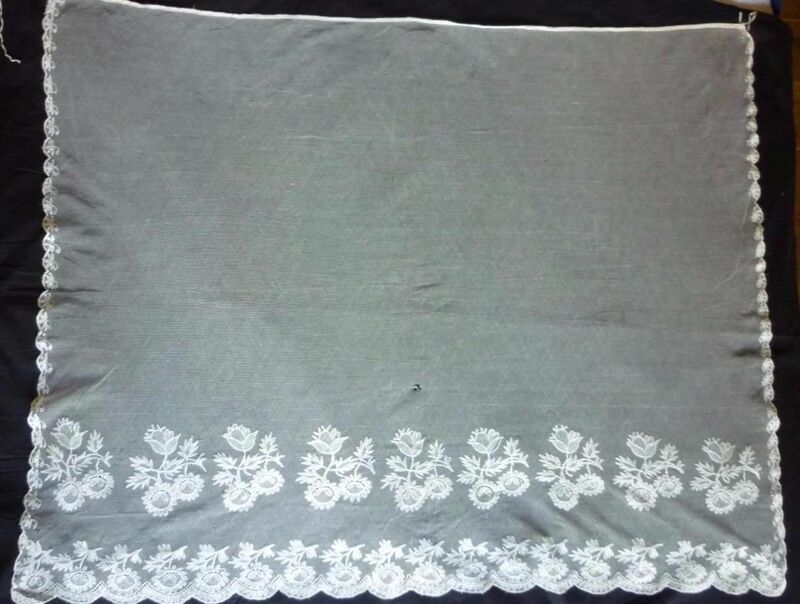 This piece is applique on machine net. Standard floral design with small motifs. Damage: One small hole (at the end of the scissors) and a few pinholes in the tulle. Finish: Motifs are not quite crisp, probably from a past wash. Slight creasing in the center cloth. Sold for 82.00 EUR, 6 bidders. 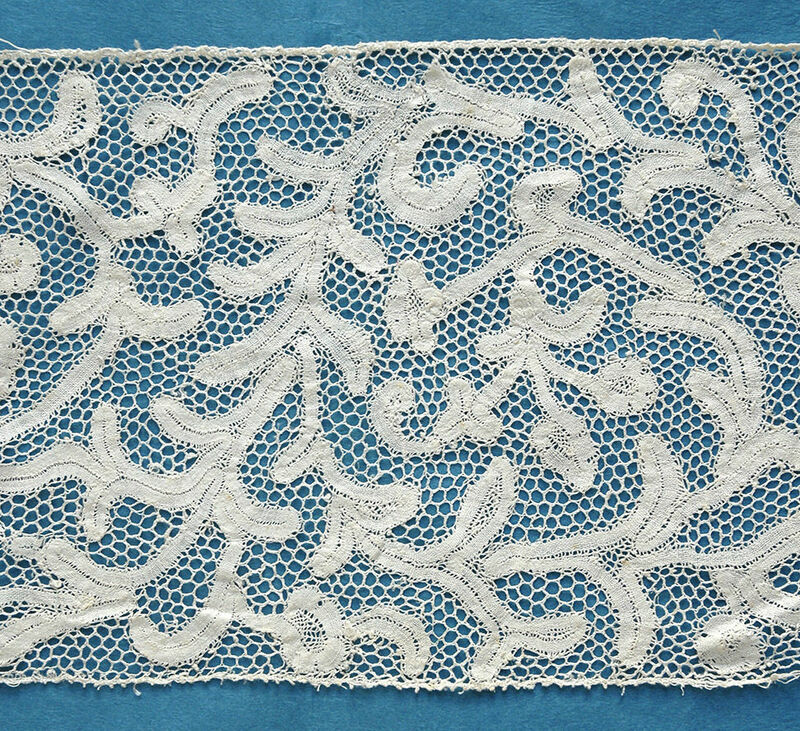 Comments: A Milanese bobbinlace with the plaited 6-side ground typical of late 17th early 18th c. The tape technique is more complex than the example reviewed above, doubling back on themselves, and forming flower head terminations. 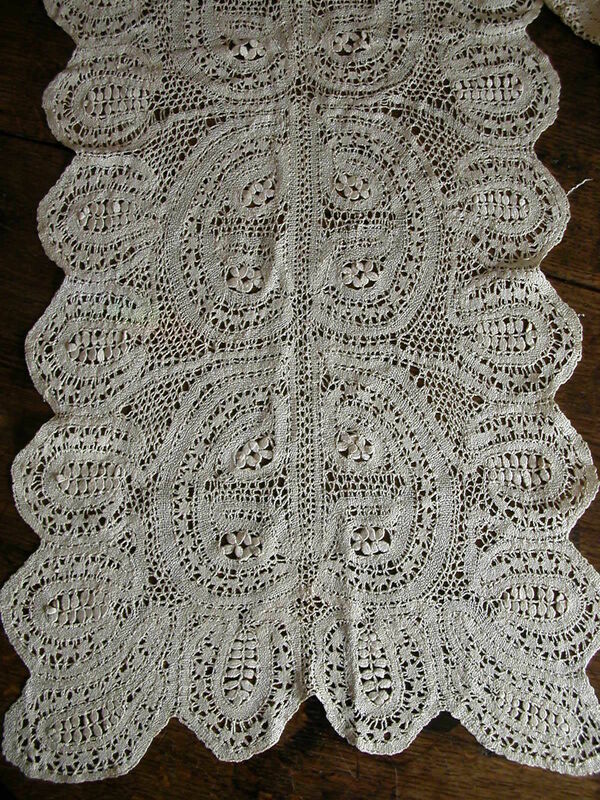 From the seller’s description of the ‘hand’ (general feel) of this lace, it probably is early. Modifications: Cut and secured on one end, can’t see much of the other end. Damage: Foot edge is a little frayed, probably originally sewn to something else. Seller cites some areas of wear and some small holes. Soilage: Seller cites pale cream color. 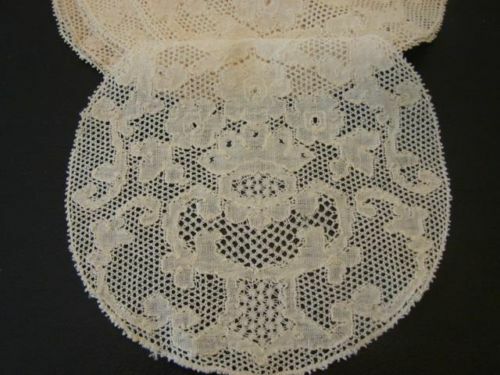 http://tinyurl.com/qx6xgge 79 ins antique/vintage bobbin and needle lace from France vgc. 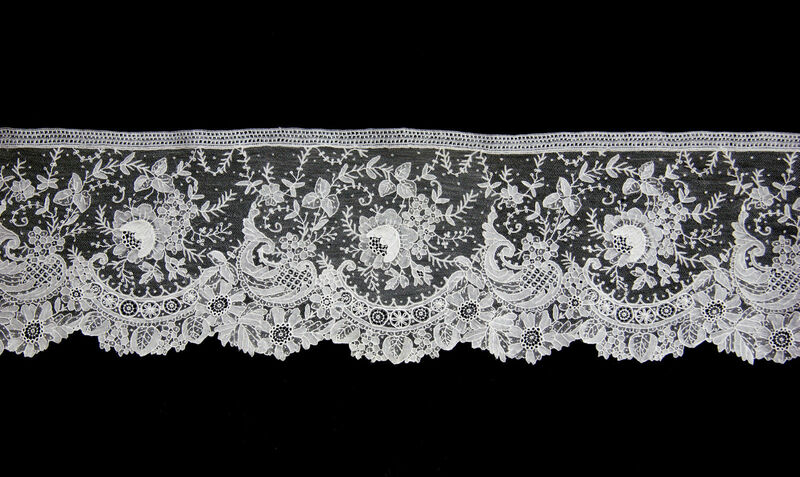 Comments: This is a lace generally called Point de Milan, and is a later 19th c product. It can vary greatly in quality, but this one looks well above average. 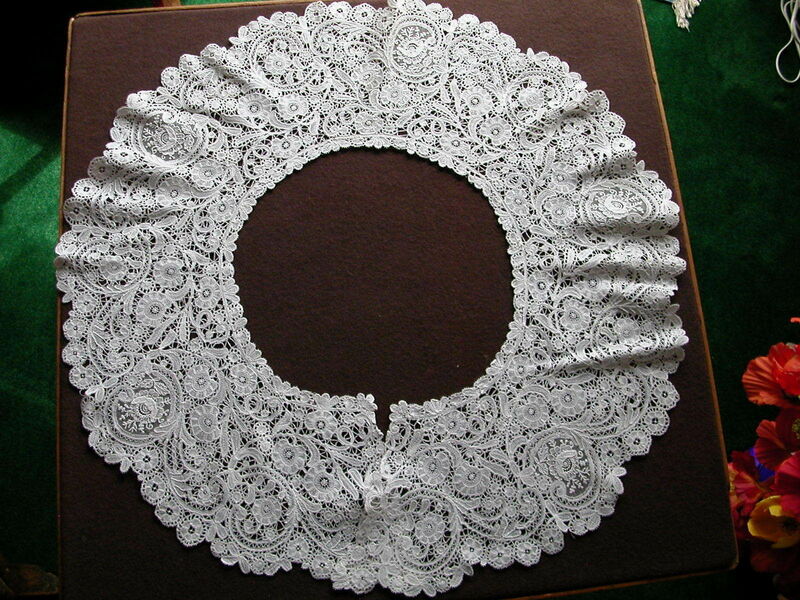 It is characterized by bobbin motifs with a coarse needle-made mesh, and was often used for table linens. Here there are also some needle-made fillings, and the bobbin fillings show a little innovation. I think the motif might be a chalice, so it could be a religious piece. 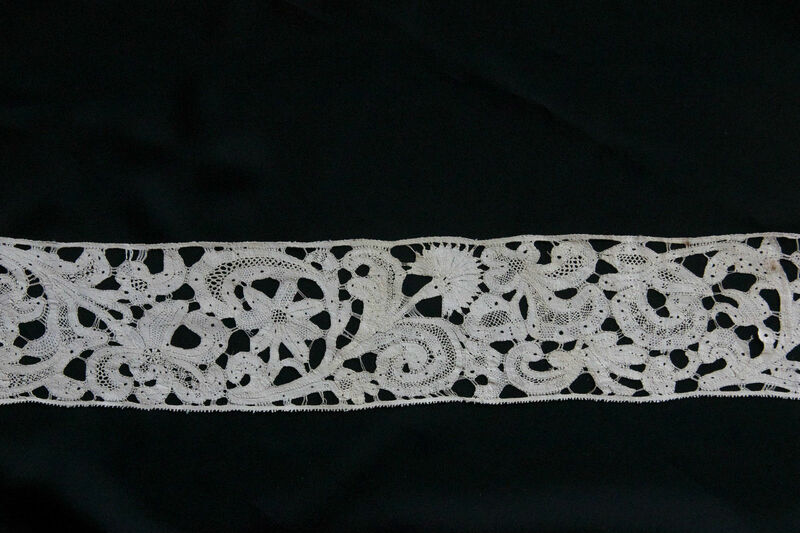 The bobbinlace is good quality, with carefully shaped motifs. Could be Belgian, although France and Italy are possibilities. 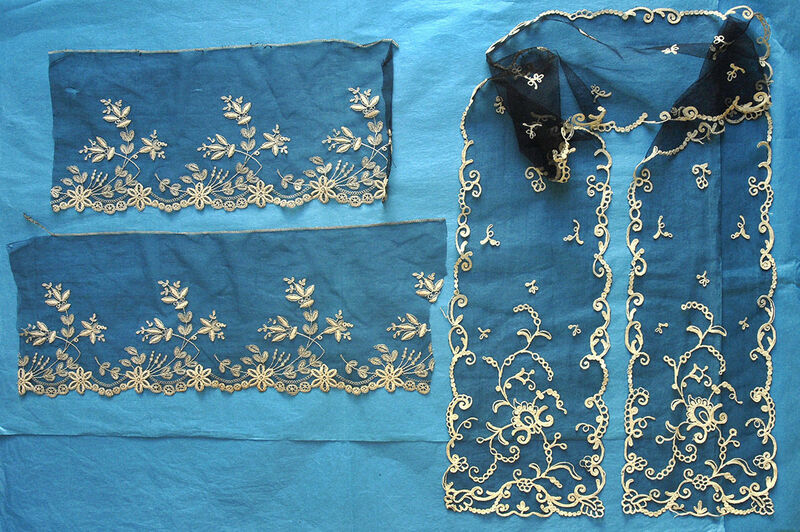 It is not a well documented lace, despite the proliferation of early 20th c pieces seen today. Modifications: One end nicely terminated, the other looks cut. Soilage: Seller says it is a little age darkened. Finish: Might be some soft vertical fold creases. Sold for 74.00 GBP, 4 bidders. Size: 3.75″ x 77″ for both. 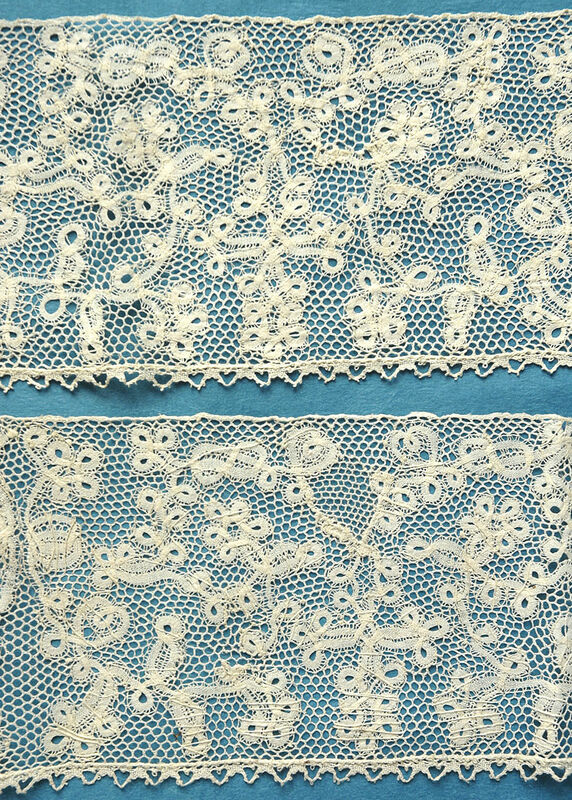 Comments: Two pieces of the same border of Brussels bobbinlace applique on machine net. Fairly elaborate pattern for a narrow border, excellent technique in the small motifs. I especially like the narrow ribbon design just above the border Simple esprits throughout the ground. A few simple needle-made fillings. Modifications: I think all the ends are cut, but look secured. Damage: Pinholes and tiny holes throughout the mesh. Soilage: Seller says they are a little age darkened. Sold for 40.50 GBP, 3 bidders. Comments: A border of what I’ll call Point d’Angleterre because of the Point de Gaze elements. But it also has plenty of bride elements. 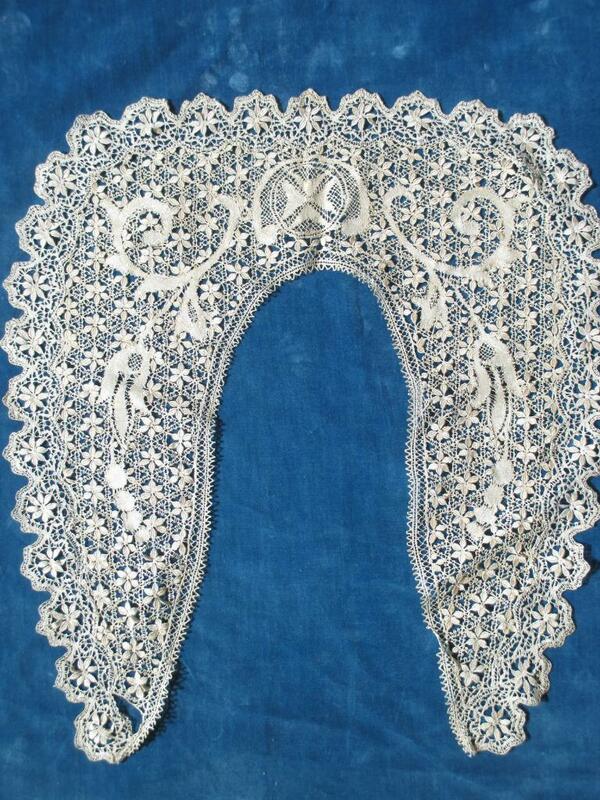 It has a beautiful unusual design, with elaborate decorative needlemade ‘mode’ fillings. Quite beautiful, although difficult to see on the light background. Finish: A few vertical fold creases. Sold for 165.00 GBP, 5 bidders. Comments: Large veil or perhaps an apron of needlerun embroidery on machine net. It has the heavy border on one end with large flower sprays like you see in Blonde de Caen. Some of the leaves ar very feathery, reminding me of Beveran. Might be a Lierre piece. Damage: A few pinholes and pulls in the tulle. Comments: 10 small doilies or coasters of Point de Paris. 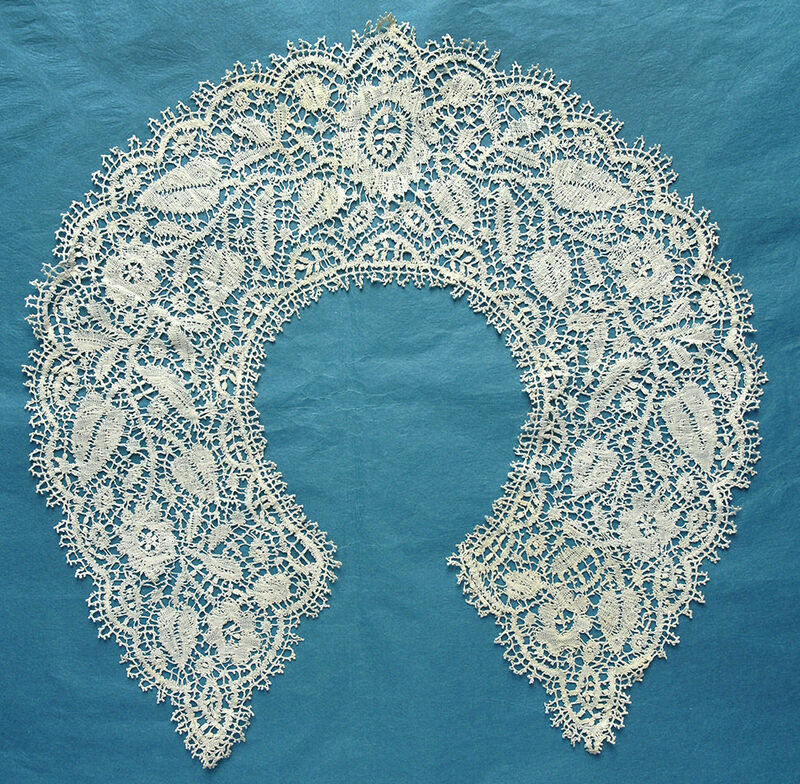 The motif in the centers appears to be a flowerpot with 3 blooms coming out, consistent with the long line of ‘pottenkant’ laces. Some interesting snowflake and one other filling that I can’t see too clearly. Nice work, and they are sewn together just as bought. This is part of a larger set. unsold as of 4/28/2015 5:43 PM MDT. Comments: A border of Point de Gaze with raised petal roses. I like the shape of the raised petals, and there are interesting decorative ‘mode’ fillings stitches. Excellent romantic design, a little better than often seen. Damage: Occasional pinhole in the mesh, minor. Sold for 129.00 GBP, 4 bidders. 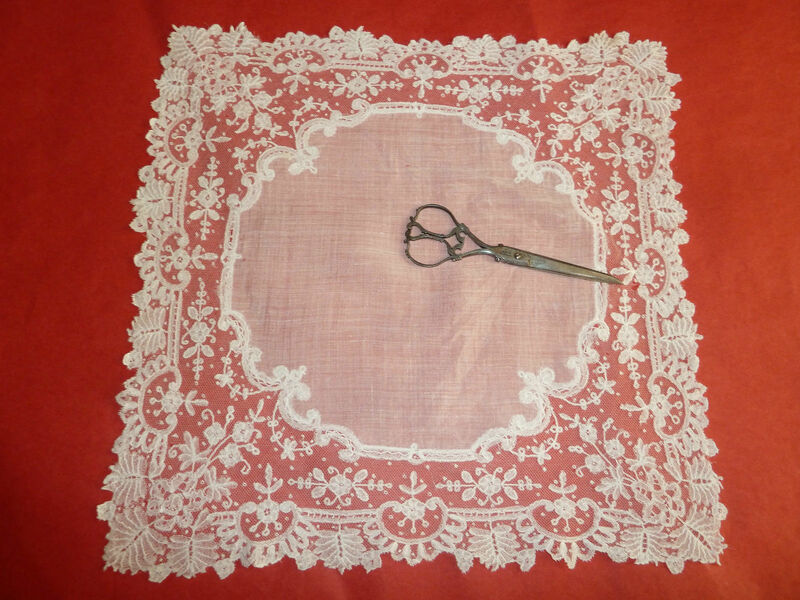 Comments: A handkerchief has a Chantilly edging sewing around the edges, and an insertion next to the center square. 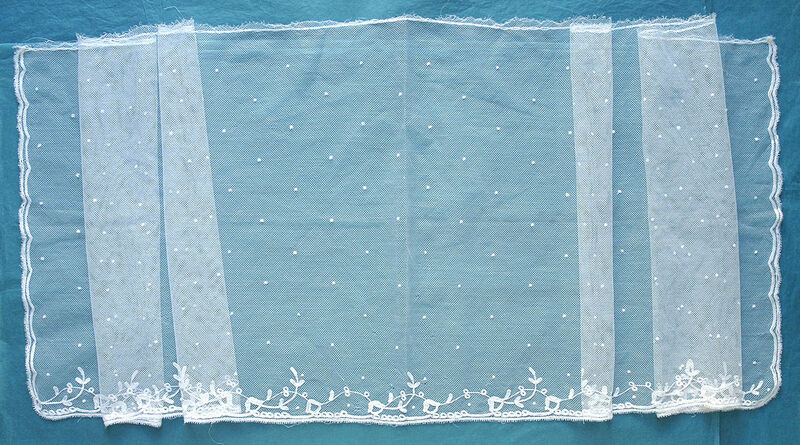 Chantilly is not often seen in handkerchief form, whether made as a single piece, or gathered like this one. 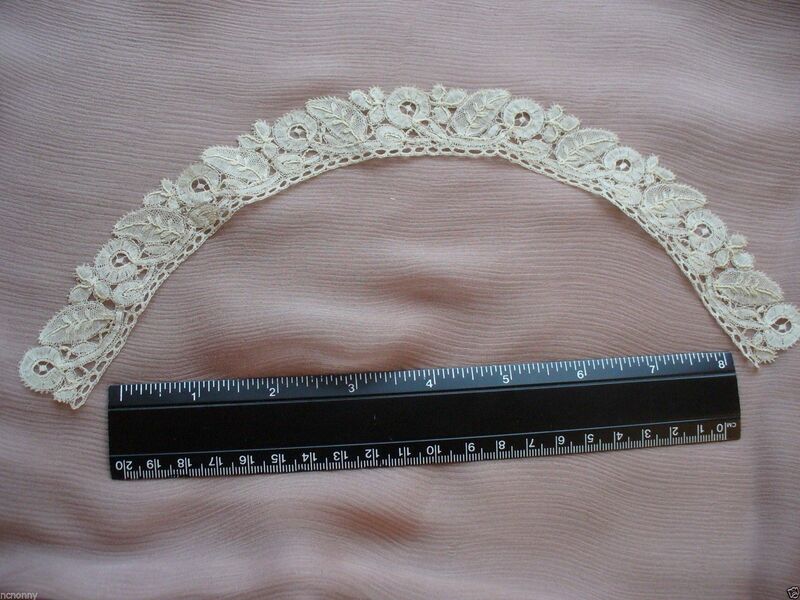 The lace design is fairly simple and works quite nicely in this form. The little butterfly must have meant something to the owner, it doesn’t seem to add anything to the overall piece esthetically. 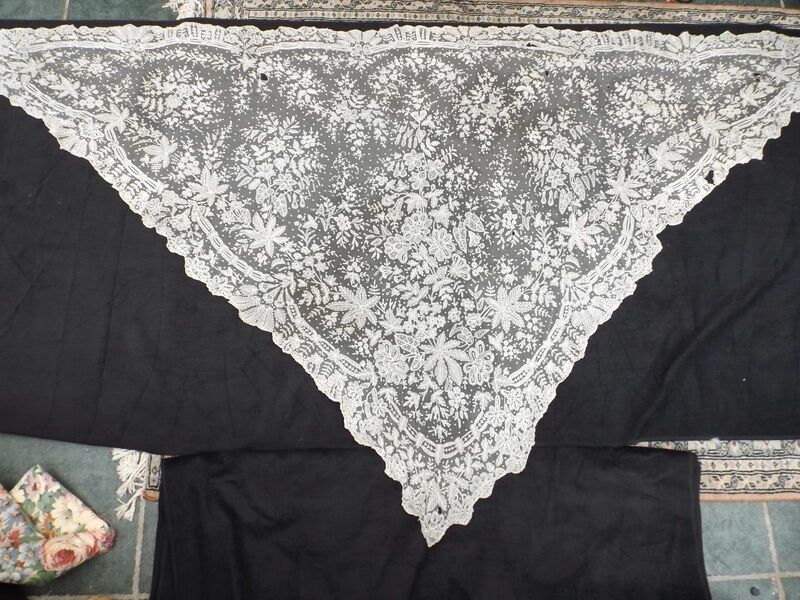 Probably made as a mourning handkerchief, but even then you’d expect the cloth to be black. Modifications: None, other than the fact that this is an assembled piece. Comments: Quite a beautiful later 17th C Milanese border. Good decorated clothwork and minimal twisted brides, but the real excitement comes from the flower designs. 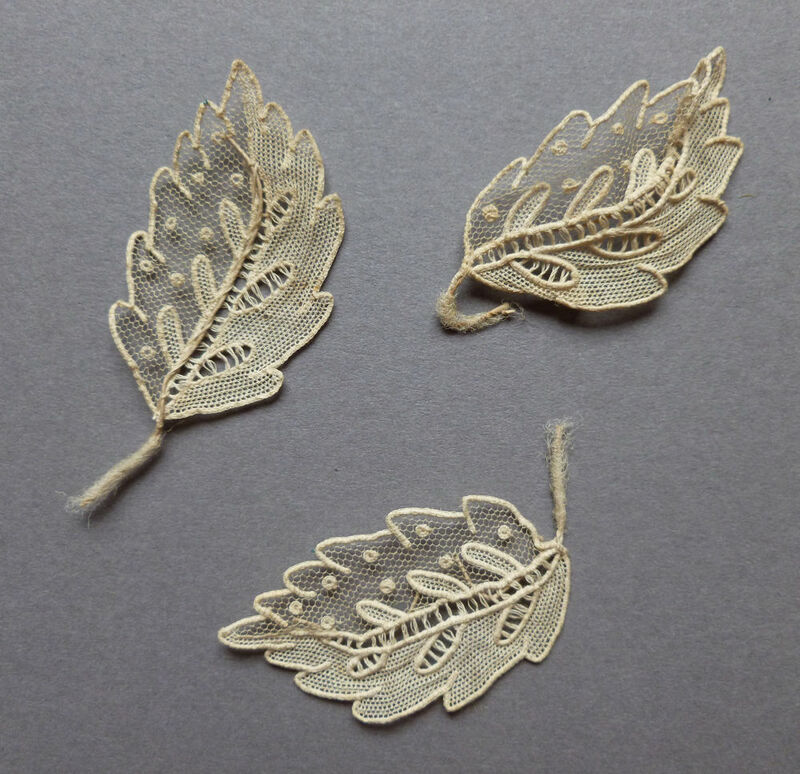 Note also a few woven leaves used in the fillings, typical of Milanese of this period. Damage: Some tiny breaks, very minor. Sold for 250.00 EUR, 1 bidder. Comments: A small collar of Duchesse de Bruges. The small flowers and leaves with raised work are typical Belgian motifs. Nicely organized with looped neckline. Looks unused. 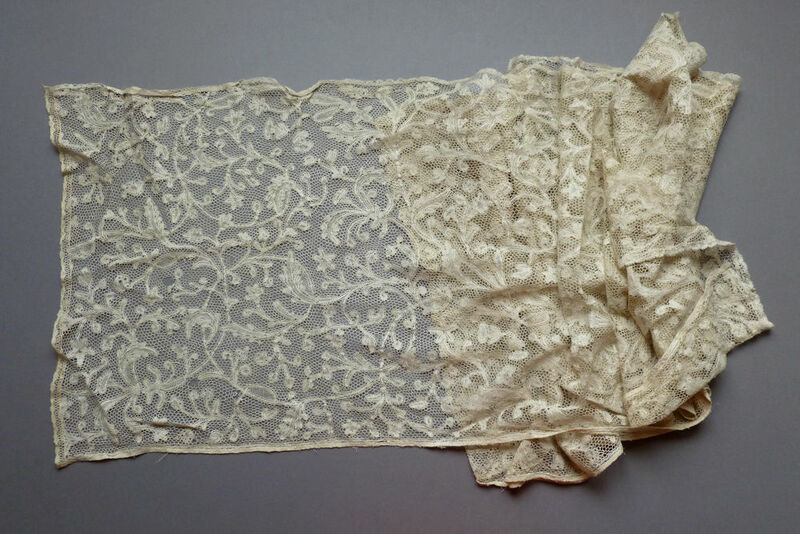 http://tinyurl.com/n2t8cbp Very Long Pure Silk Cream Maltese Lace Shawl / Mantilla / Scarf / Wrap ~ Bridal? Damage: Stray thread loose on the border in places, minor. Sold for 43.00 GBP, 4 bidders. 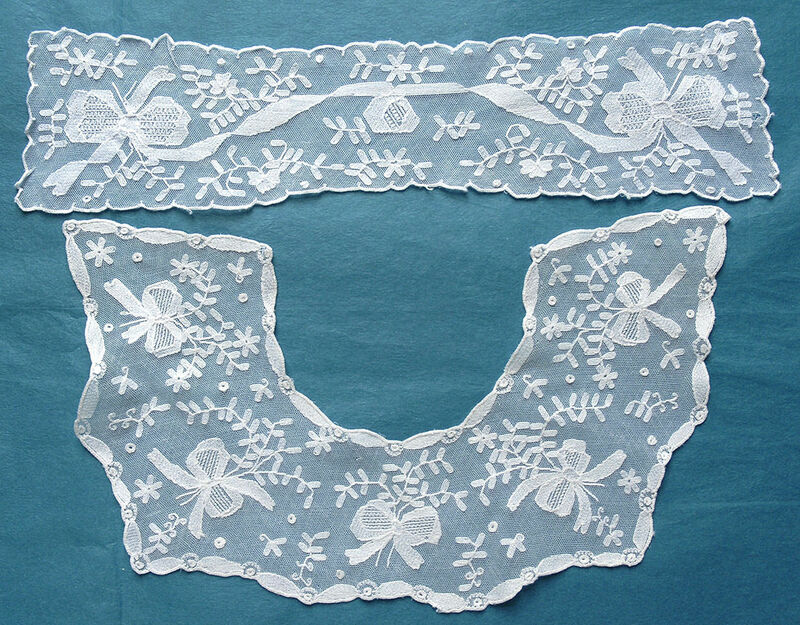 Comments: Border of needlelace in the style of Gros Point, 19th c. Nicely done, note the decoration on the raised edges, and also the fairly elaborate brides. Someone had a good example of early Venetian work in designing this. The design is rather crowded. You see the heavily decorated rings in the middle of the clothwork in Austrian piece, however they they end to have a more Art Nouveau design. I’m wondering if this is an Irish piece. Modifications: One end cut, other end looks original. Sold for 84.99 GBP, 8 bidders. Size: 34″ neckline, 80″ outer edge, 6.5″ deep. Comments: A Brussels Duchesse bertha with raised petal roses in the Point de Gaze inserts. No raised work in the bobbinlace, but they do have needle-made filings in the flowers that are more associated with Point de Gaze. The flowerheads are also a little atypical for Duchesse, but nicely done. A little on the Bruges side with all the gimp borders. Damage: Nothing obvious from the photos. PdG mesh looks good. Sold for 142.00 GBP, 6 bidders. 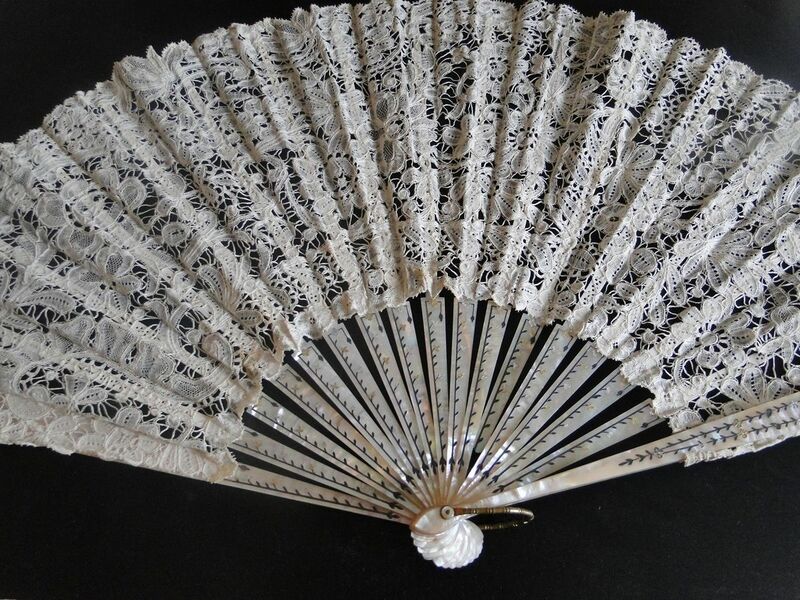 Size: 9″ x 17″, fan. 17″ x 25″ frame. Comments: A Brussels Duchesse fan with raised petal roses in the Point de Gaze inserts. Some raised work in the bobbinlace also. Note the righthand Pt d G rose, also the one at the left end which have no ground. Conventional Duchesse motifs. Inlaid MOP sticks. Size: 113″ x 80″ (I think the 80″ is along the sides). Comments: This is the second Brussels bobbinlace applique on machine net triangular shawl this week. 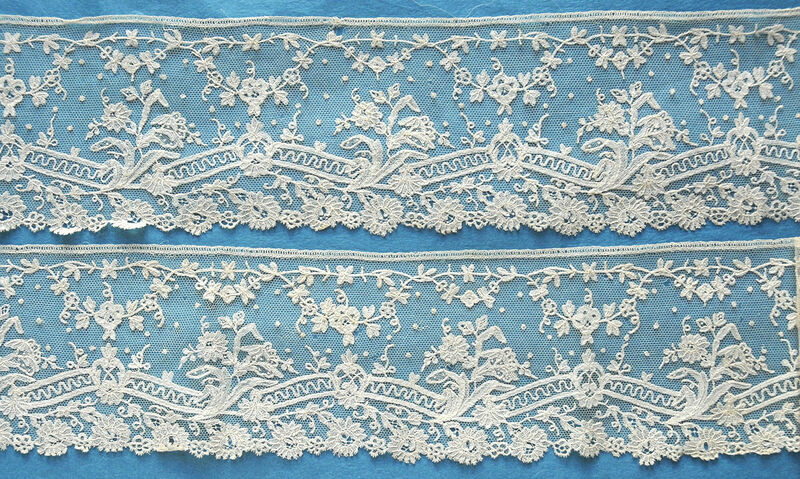 Needlelace is used for flower fillings, not motifs. I think I see a few needlerun stars in some of the tulle near one leaf. It has an elaborate romantic 2nd empire design with naturalistic flowers and plants.. These were meant to drape over women’s crinoline skirts. Quite an impressive high-end market piece. Provenance: From a New York City estate. Damage: Seller sites 2 tiny breaks in the tulle. I see a few pinholes near some motifs. Soilage: Light yellowing in one corner. Finish: No obvious creases or wrinkling, although the photos aren’t close enough to tell. Sold for $1,051.00, 4 bidders. Comments: A narrow scarf of Duchesse de Bruges. Some raised work on the bandwork in the bobbin lace. Precisely made motifs, a little conventional, but it all works well together I especially like the small buds around the long edges of the piece. Damage: A few broken brides. Soilage: Seller cites age discoloration, and a few light spots. Finish: No obvious creases or wrinkling. Unsold as of 4/29/2015, 2:21 PM MDT. Comments: A Point d’Angleterre border, later 19th c. Good decorative ‘mode’ needlelace fillings, I especially like the ring around the cup of the ‘daffodil’. Also the small raised rings in the centers of buds, much like Rosaline. Good design and workmanship. Modifications: One end cut, the other might be a natural beginning. Engrelure added. Damage: Seller cites two tiny holes. Sold for 56.00 GBP, 2 bidders. 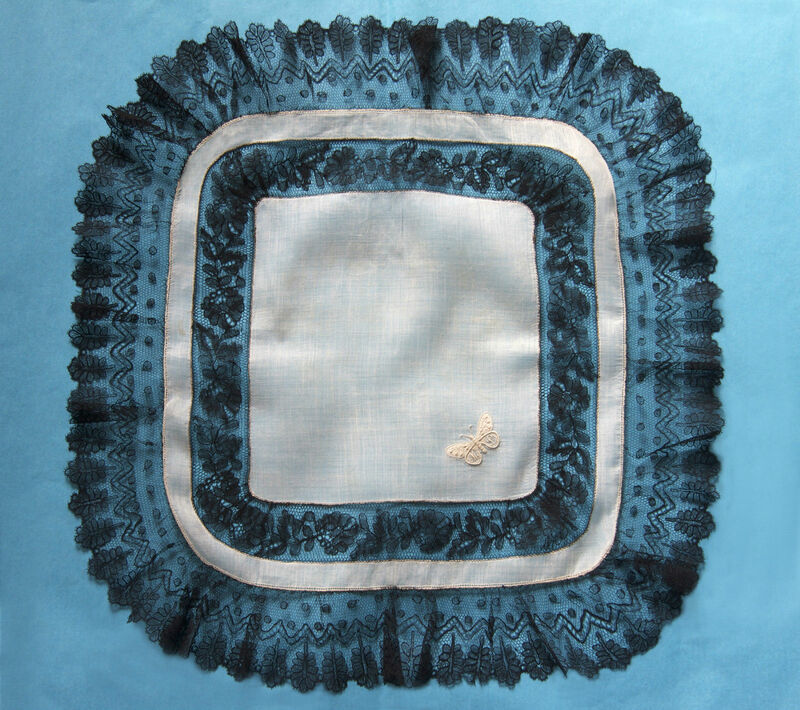 Comments: A handkerchief of Brussels bobbinlace applique on machine net. 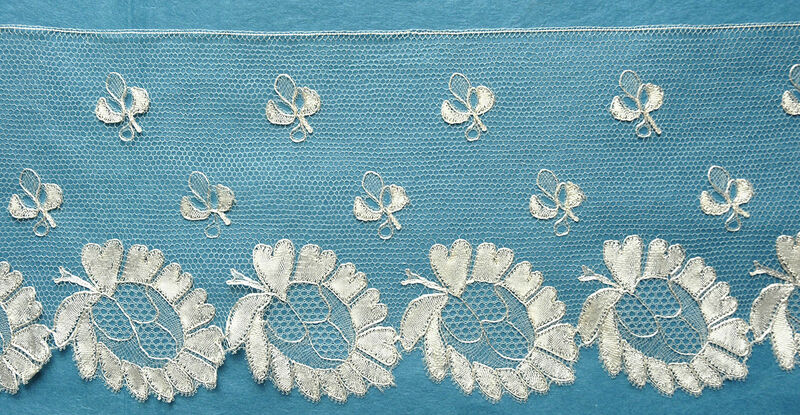 Needlelace fillings are mostly small rings and knots. Excellent, if a rather regimented design, with small delicately worked motifs. Very nice presence to this piece. Damage: One small hole in the cloth. Lace looks fine. Finish: Some light creasing in the cloth. Comments: A Point de Gaze handkerchief, no raised work. Very little in the way of decorate ‘mode’ fillings, just some knots. But that’s OK, the design is good and the technique well done. Note the spiky wide-spaced picots along the outer edge, sign of a forgotten higher quality manufacturer. Damage: Small holes in the pt de Gaze mesh throughout. Finish: Horizontal and vertical fold lines. 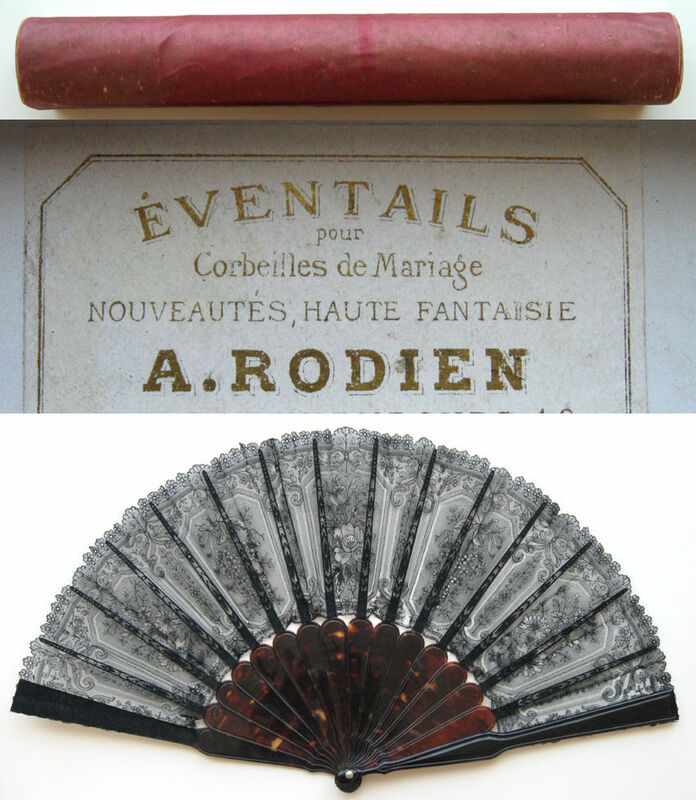 Comments: A Duchesse de Bruges fan with inlaid Mother of Pearl sticks. Conventional Duchesse motifs, no raised work. The design is rathr scattered, and I’m a little confused by a band of motifs just next to the sticks on the lower edge, it almost looks added in later. Beautiful inlay work on the sticks. Damage: Two sticks have cracks. Lace looks good. Comments: A Duchesse de Bruges dress front, no needlelace that I can see. Provenance: None cited. Good design, and I especially like the increased use of brides near the neckline. 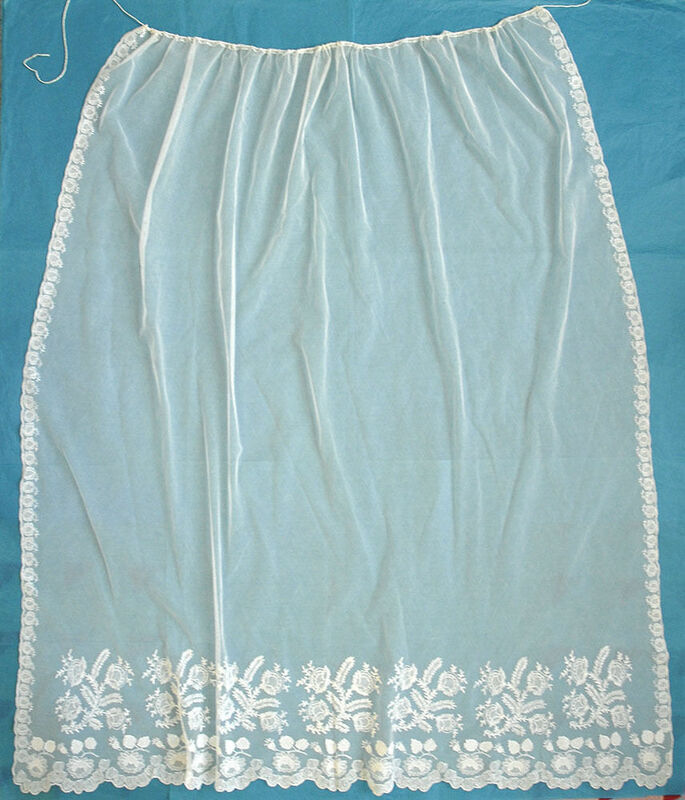 The use of woven tally fillings almost makes it look like Honiton, but the motifs aren’t typical of that lace. Rolled threads used as raised work. Finish: Vertical fold crease down the center. Sold for 62.00 EUR, 4 bidders. 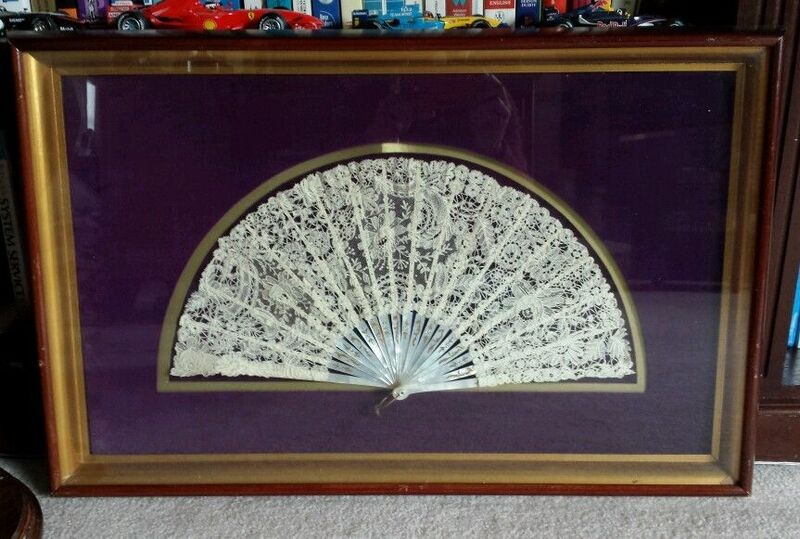 Comments: A Chantilly fan with imitation tortoiseshell sticks and what look like pierced ebony slips. Comes with a box labeled A Rodien. 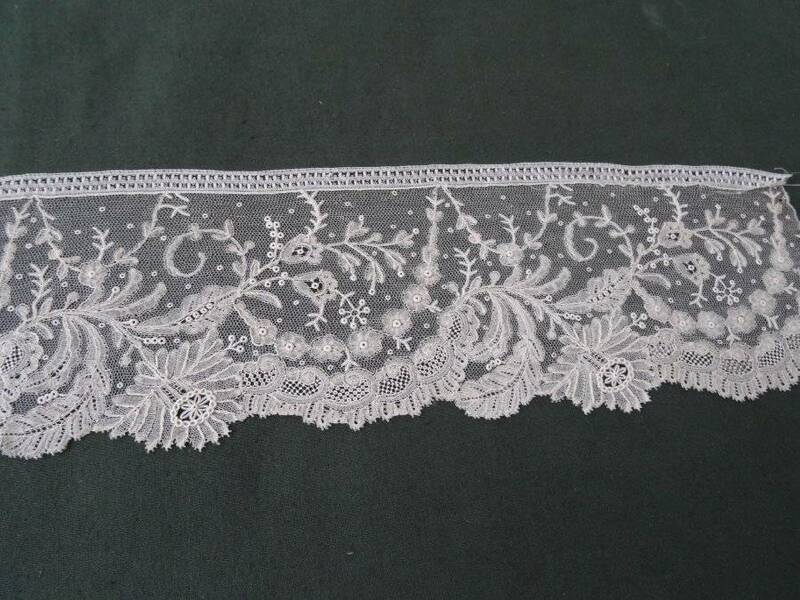 The lace is very high quality Chantilly with ombré shading, excellent technique with very fine thread. Probably French manufacture. The little ‘windows’ each with a different flower arrangement are amazing. I don’t like to gush in these reviews, but this is one of the best Chantilly fans that I’ve ever seen. Damage: 2 small holes in the lace near bottom right edge. A few repairs near bottom edge. Soilage: Looks clean, but hard to tell with black lace. Seems to have been framed for a long time. Sold for 499.80 GBP, 15 bidders. 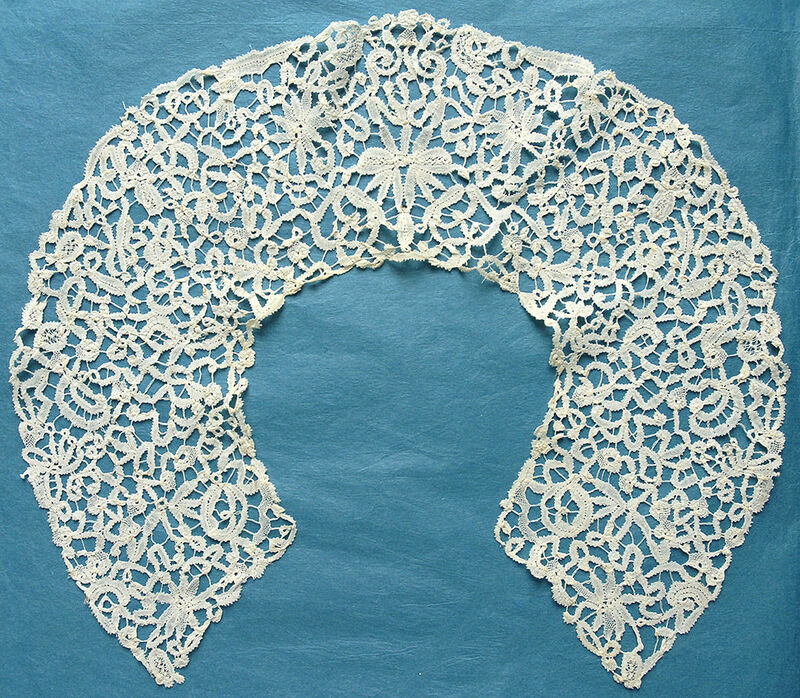 Comments: A bonnet veil of embroidered machine net. The original drawstring still runs through the top edge. Needlerun motifs with some good filing stitches. ‘Blonde de Caen’ design with large flower sprays along the bottom border. No esprits in the net, and just a narrow band of motifs running up the sides. Provenance: From a house clearance. Finish: A few creases and wrinkles throughout, but overall this is a net with a lovely drape. Unsold as of 5/1/2015 9:54 AM MDT. 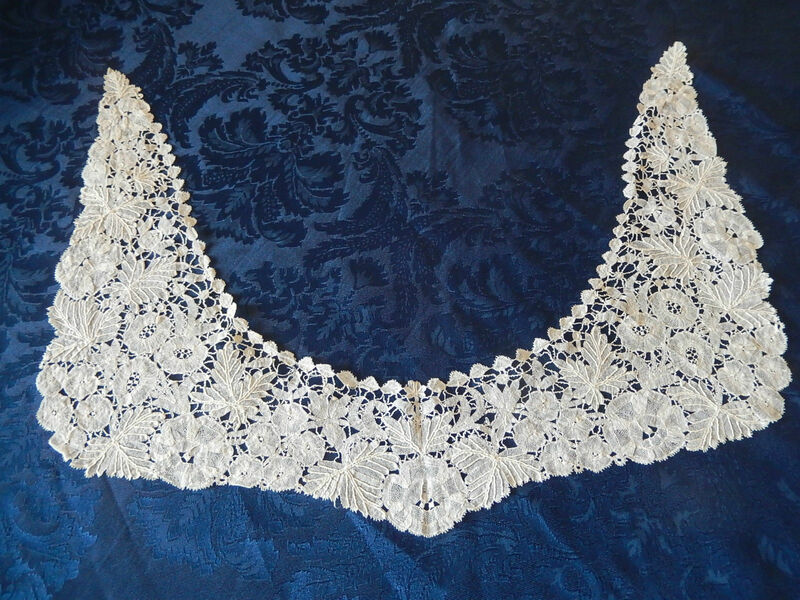 Comments: A Duchesse de Bruges collar with front lappets. Conventional design and motifs in a nicely shaped piece. Finish: Looks a little worn, perhaps from past washing. Sold for $49.00, 2 bidders. Comments: A wide Duchesse de Bruges flounce with some Point de Gaze-like needlemade fillings. Irregular plaited, picoted brides. Some interesting edge treatments to a few motifs, but overall the design seems a little off scale in places. Damage: A few broken brides and small repairs. Finish: Motifs a little shrunken, probably from past washing. Sold for 160.00 GBP, 9 bidders. Size: 17.5″ neckline, 5.5″ back depth. Comments: A round collar of Beds, with a strong Armstrong floral design look. 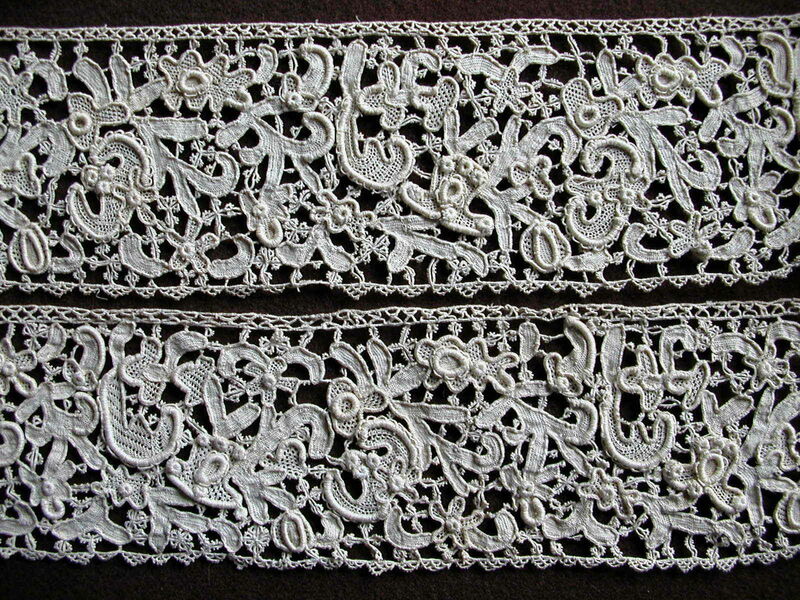 There is no gimp in the motifs, and I know that modern lacemakers have an ongoing debate on whether the gimp is needed. But in earlier pieces it is common to find it. Here I think it gives the piece a more open look. Excellent design and work. Soilage: Seller cites slight discoloration. Comments: A square veil of Honiton applique on machine net. It has a double border of motifs around all the sides that I can see, with large sprigs used as esprits. Good woven tally leadwork fillings. Often these have a large flower mass in the corners, but I don’t see that here. Damage: Only two photos, but I see some pinholes in the mesh. Unsold as of 5/2/2015 8:01 AM MDT. Comments: A rectangular shawl of Duchesse de Bruges, but with some elaborate needle-made accents. Particularly the rings around one flower center – this is photographed from different angles so I’m not sure how often it occurs in the total design. Good raised work in the bobbinlace. Excellent massed floral design, and I’m impressed with how well woven the motifs are, especially the larger ones. A high-end market piece. Soilage: Ecru color. Some localized brown stains. 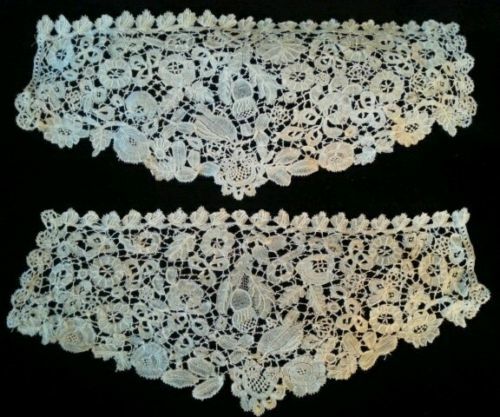 http://tinyurl.com/pehrhvb Magnificent Antique Handmade Brussels & Pt de Gaze Lace Bertha/Collar-BEST! Size: 46″ neckline, 98″ outside edge, 6.5″ deep. Comments: A Point d’Angleterre bertha, later 19th c. The bobbin-made motifs are fairly large, and note the unusual concentric rings of needlelace decorative stitches in flower centers. A little raised work in the bobbinlace. Standard Point de Gaze ground. There is a class of Point d’Angleterre that has this larger look, but more of it seems to have been made on a finer scale. Provenance: From a local estate. Damage: One small hole in the mesh.